With the recent release of Gears of War: Ultimate Edition for Xbox One, the maiden release from Microsoft’s Vancouver-based team The Coalition, one of the biggest franchises of the previous generation is back in the spotlight where it belongs. First announced back at E3 in June, its stage presence in Microsoft’s keynote put to bed months of rumours that we’d be getting remasters of the entire series, along the lines of the Master Chief Collection. Gears of War: Ultimate Edition brings Delta Squad’s first adventure to Xbox One, with some extra bells and whistles and visuals rebuilt from the ground up. Now nine years old, Gears of War was a graphical powerhouse when it burst onto Xbox 360 in 2006, but in the cold, harsh light of 2015 it’s surprising how rough around the edges the game now looks. For most people though, that’s not how the game lives in their memories, and that’s the problem The Coalition had to tackle with Gears of War: Ultimate Edition. To that end, the team decided to keep the base geometry, AI scripting and source code – ensuring the game plays exactly as we remember it – while rebuilding absolutely everything else. Every single model and asset – over 3,000 of them – were rebuilt from the ground up for the Xbox One. That includes cutscenes, which have been re-framed, re-shot and re-mo-capped in their entirety, while five previously PC-exclusive chapters of the game – comprising roughly two hours of gameplay – that had to be excised from the original Xbox 360 release have been reinstated here. Gears of War: Ultimate Edition is not so much a remaster as it is a remake. It’s not just in the visual department that the new team want to make their mark, though. Back when Epic were first building Gears of War, they had no idea whether it would become a franchise, with sequels, merchandise, companion novels and the like. As the franchise evolved, so did the games, with Gears 3 in particular digging deep into the backstory and characters from the extended universe material. The Coalition wanted to draw some of those interconnecting lines back into the very birth of the series, though to preserve the game mostly as we remember it, they chose to go about it in fairly subtle ways; in a panel at this year’s SDCC, the team talked about some of their efforts to tie the original game more deeply into the wider world of Sera, mentioning a message scrawled in blood – “Welcome to the Slab” – in the opening prison level as an example of this – that prison wasn’t actually named until Karen Traviss’ 2008 novel Aspho Fields. Other touches are more overt, yet still hidden to a degree; collectible CoG tags now unlock pages from the series’ canon of comic books, that you can later read in the game’s menus. 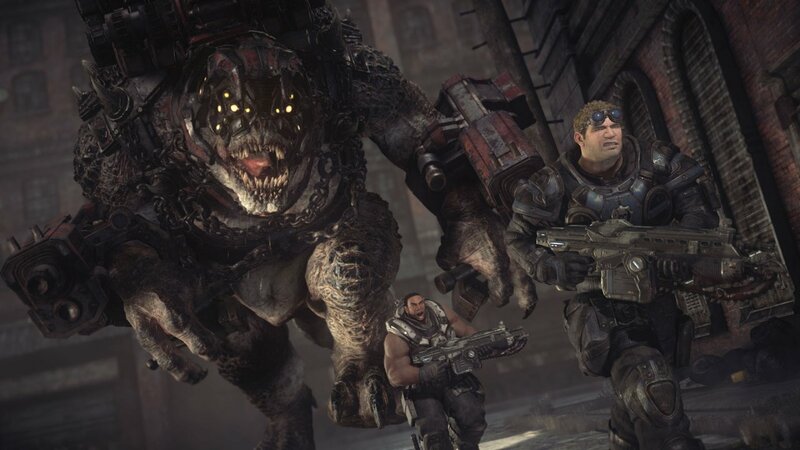 Clearly, Microsoft had to do something to secure the future of Gears, a franchise that Xbox head honcho Phil Spencer has called “part of the soul of Xbox.” It’s worth remembering what an enormous impact Gears of War had last gen: for many, it was the first truly ‘next-gen’ moment of the 360/PS3 cycle, influencing future projects like Uncharted, before going on to sell more than 22 million units and break the billion-dollar mark in franchise sales. So while we don’t know how much the acquisition cost Microsoft, and we’re unlikely to ever find out, its value to the Xbox brand is clear. We do know that it effectively cost Microsoft a studio though, or at least that studio’s name and potential (read: non-Gears) output. The IP acquisition led to Black Tusk (itself formerly Microsoft Vancouver) changing their name to The Coalition (a reference to the in-universe Coalition of Ordered Governments) and taking on Gears of War exclusively; much like fellow first party teams 343 Industries (Halo) and Turn 10 (Forza), The Coalition will now become ‘The Gears Studio’. This has unfortunately led to the shelving of Black Tusk’s previous project, known only as Shangheist (and of which only a vague concept trailer was ever shown), which has given some cause to decry Microsoft’s strategy of tying their small number of first party teams to a single franchise. However, Microsoft’s strategy for new IP appears to be geared more towards creating and curating new franchises with third party partners (see Platinum with Scalebound, Remedy’s Quantum Break, and ReCore with Comcept and Armature, for instance), while building up top-tier teams to handle their most valuable assets. With Microsoft retaining those IPs, this could be a smart way to do business and increase the brand’s pool of properties, but we shall have to wait and see how such a strategy pans out over the coming years. One thing’s for sure though: with veteran series producer Rod Fergusson at the helm, Gears of War looks to be in good hands indeed, and the team at The Coalition is using their experience rebuilding the first game as a learning experience for the future. Upon Fergusson’s arrival at Black Tusk, as it was still known then, he tasked the team with a week or two of nothing but playing Gears games, the idea being to bring everyone up to speed quickly and furnish the entire team with an intimate understanding of what makes the games tick. The Ultimate Edition of Gears of War thus serves a handful of different functions: not only does it fill a slot in Microsoft’s end-of-year blockbuster blitzkrieg, but it also gets a Gears game on Xbox One to let people know that the series will see a continuation. 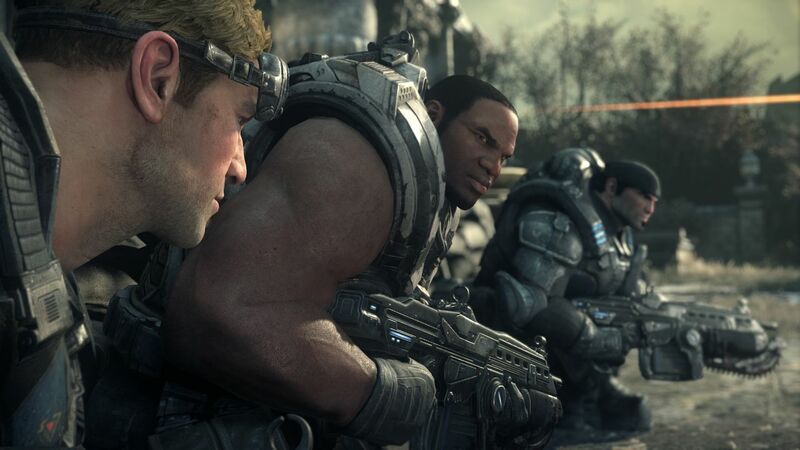 Most importantly for the future of the franchise, it serves as, in Fergusson’s words, “the perfect on-ramp” for the team to take the franchise forward with Gears of War 4. And what of Gears 4? That game was also fully unveiled back at E3, with Fergusson rather surprisingly demoing a six-minute playable slice that introduced the characters of JD and Kait and the beautifully rendered, dark and creepy world they inhabit. Not much is known about the setting for the game – we’re assuming it’ll still take place on Sera, but there’s no indication what time period it’s set in, who these two new leads are, or even what it is they’re doing. One thing we can discern is, perhaps, the tone of the game. Gears has never been anything other than a big summer blockbuster action game, but the first instalment definitely had some horror stylings to it – it was massively influenced by Resident Evil 4, after all. For all its pale snarling monsters, impossibly-proportioned soldiers and Cole Train “Woo!”s, it was, at times, a darkly atmospheric experience, as anyone who remembers the foreboding, rain-soaked Lethia Imulsion Facility can attest, and while the later games didn’t necessarily lose that atmosphere, they definitely leant more towards the all-out-war side of the Gears experience. Gears 4 seems to be heading back to that tone, with the demo showcasing two lone Gears tracking some elusive, deadly prey through a deserted town in the midst of a deafening storm, only to discover that some hideous organic growth has taken up residence in the absence of people. Just what is going on in Gears 4 will be the subject of much speculation for fans of the series as we head towards its late 2016 release, but right now, all eyes are on The Coalition’s shiny rebuild of the game that started it all. It’s time to start flexing that active reload finger. Wii U Zelda still a way off. Despite showing an HD Zelda demo at last year’s E3, Shigeru Miyamoto has stated that a franchise title for the Wii U is currently only in the planning stages. In an interview with Entertainment Weekly, the legendary developer noted the HD demo garnered “a positive reaction” and reflected on Skyward Sword‘s motion controlled combat. This shouldn’t come as much of surprise, given the series’ release schedule over the last decade; since The Wind Waker in 2003, we’ve had Twilight Princess in 2006 and last year’s Skyward Sword on home consoles. So an HD Zelda adventure is likely a few years away yet, but going by last year’s demo, it’ll be well worth the wait. SCEE “very relaxed and confident” about Vita situation. Despite Vita sales remaining flat in the months since launch, Sony Computer Entertainment Europe CEO Jim Ryan told C&VG they aren’t worried about its prospects. After mostly ignoring their floundering handheld in their E3 keynote, some might see this as complacency. That decision was rendered even more bizarre given the existence of a sizzle reel trailer for the Vita that looks as though it was meant for the conference. Could they not have shaved three minutes from the bloated Wonderbook presentation to show this? That’s all well and good, but you need to show the content. I adore my Vita, but if Sony want consumers to get behind the machine, first they need to get behind it themselves. The next-gen pays E3 a visit. Even though both Microsoft and Sony had categorically stated they would not be showing new consoles at E3, many believed this was just an elaborate smoke-screen designed to mask a surprise reveal. With the benefit of hindsight, we know this was merely wishful thinking, but we’re now late in the current generation of console tech and we know that new machines are coming at some point. With this in mind, two industry heavyweights chose E3 to show off their new rendering middleware. First up, Epic’s Unreal Engine 3 successor, cleverly named Unreal Engine 4. We’ve seen stills from this ‘Elemental Knight’ demo in a Wired article a short while ago, but it’s much more impressive in motion, showcasing some fantastic lighting and particle effects. We also have a new video from Square-Enix, who took the opportunity to announce Final Fantasy: Modern Warfare! Oh no, wait. It says here that it’s a tech demo for their new Luminous Studio engine. The demo, called Agni’s Philosophy, is a teasing peak at what a future Final Fantasy might look like. So… not much like Final Fantasy at all? It’s incredibly impressive stuff though, especially in character’s hair and the level of environmental detail. Perhaps it’s the less fantastical environments and character models, but I find Square-Enix’s demo the more impressive of the two. Will games look as good as these two demos on our next-gen consoles? I can’t help but think they won’t, but it certainly gives us something to look forward to. The games of E3: Gears of War: Judgment. Expected by many to be a big draw in Microsoft’s conference, Gears of War: Judgment was only given a token appearance during the Redmond company’s 90 minutes. The short teaser, below, stars Kilo Squad, a team of four Gears under the command of Damon Baird, a lieutenant in Judgment. They seem to have been a bit naughty (hence the handcuffs), and amidst fierce scenes of battle and Locust destruction, Baird’s squad are charged with many offenses – including treason. Fortunately, Larry “Major Nelson” Hryb stepped up to the plate and provided a longer look at the game. This trailer, more gameplay-focused than the first, includes some commentary from Epic director Rod Ferguson, who tells us that the game is set in the weeks immediately following E-Day, and explains that this Gears campaign will be less scripted and more open. Interestingly, no mention is made of Bulletstorm developer People Can Fly’s involvement, and from what little single-player gameplay we see, it seems to be business as usual. So it remains to be seen what, if anything, will be new for Gears of War: Judgment‘s campaign. The rest of the trailer is given over to unveiling the new multiplayer mode, Overrun. In this mode, Gears defend objectives while the Locust are on the offensive, The unique hook here is that it’s class based, and if you’re fighting for the COG, you can choose from one of four classes, each with their own abilities; a medic, for instance, can throw stim-gas grenades to heal or revive team-mates, the soldier begins with a boomshot and spawns ammo for the team, and the engineer can repair fortifications and deploy turrets, while the scout can climb to establish overwatch positions, throw beacons to tag enemies for the team, and spawns with a semi automatic sniper rifle. On the Locust side, you can play as fast moving tickers, wretches, grenadiers, kantus, bloodmounts, corpsers, maulers and even the serapede. Yep, you read that right. Each Locust type also has its own special ability, such as the kantus’ healing abilities or the corpsers tunneling, and it seems safe to say that Overrun will be a rather asymmetrical gameplay experience. But it’s the single-player which mostly interests me. Seeing Sera falling apart in the aftermath of Emergence Day should be interesting, and we still know little of Baird – the books paint him as having come from a privileged background, and, much like Marcus, leaving it all behind to find his own way. It’ll be interesting to get to know him a little better when Gears of War: Judgment launches next year.